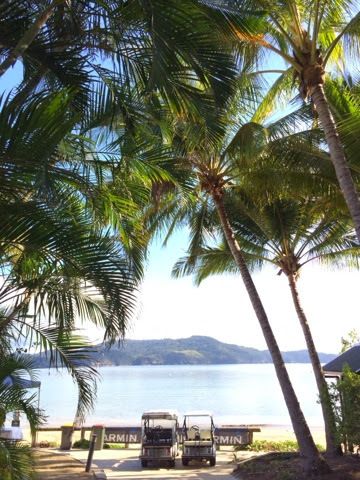 Seriously, what an amazing time I recently had away on Hamilton Island! 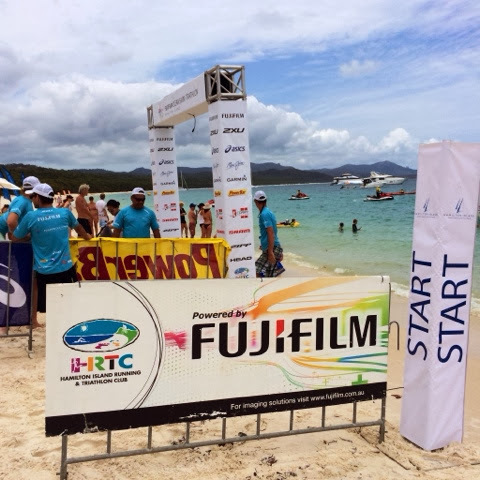 The Fujifilm Triathalon and Whitehaven Beach and Ocean Swim was held a couple of weeks ago and it has got me super motivated! 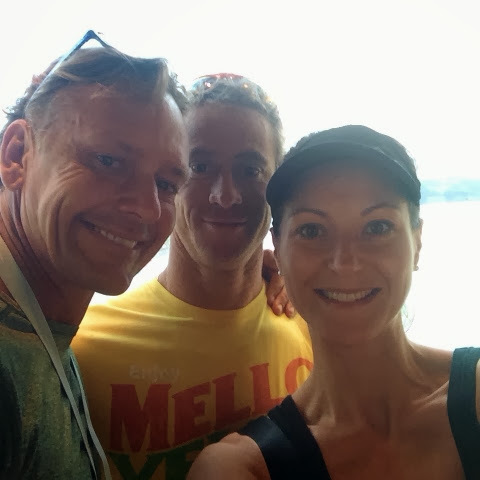 In case you missed this post last week, you can catch it up and then know exactly what I am talking about!This event has totally got me pumped and inspired to train for next year's! More than anything, I'd love to have it include more of my friends, so ... come on, how about we all go? I reckon it's totally do-able, especially if we start training now and even hold our own little mini triathlon! What do you think? Are you in? Baby steps are the go, remember. We can ease into it all, and start with a solid 25 metres at our local gym swimming pool ... then a 2km ride on the bike, to be followed by a 1km run on the treadmill. Sounds good to you, doesn't it? Seriously though, when I was invited to be a spectator at this awesome event, I jumped at the opportunity. Little did I know that I would be rubbing shoulders with some of the country's favourite elite athletes! I particularly loved the fact this event encourages such a broad range of competitors and participants. It was super to see that Ironmen/women, and Olympians too, are much like us ... aspiring to be good at something. Yes, for sure they are total champions and in their sporting element however "us" ordinary people are encouraged to also give it a go as well. Take my gorgeous friend Anita, for an example. She didn't even train for this event but was deadset keen to give it a go! And guess what? She smashed it in 2 hours!!! I am so proud of her! Hamilton Island provided the perfect backdrop for an event like this. Just imagine swimming 750m, cycling 20km - including down a unique airport runway - and finishing with a 5km run through the island's Marina. 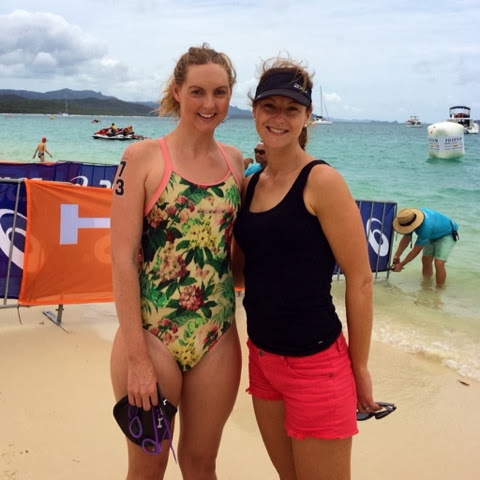 Topped off by a beach-side finish, this was a triathlon held in paradise! What a superstar you are Anita!!!! Woohoo! Staying at The Reef Hotel brought back many beautiful memories. This was my third time on Hamilton Island ... the first time was back in my career days with workmates on the R&R sales team. The second time was much more special though and was when I said "yes" to my husband's proposal! Yes indeed, my wonderful husband proposed to me back in 2005 on this very perfect tropical island. Truly, it was one of the best days of my life….Aaaahhhhh. To make perfect even better, island visitors get to wake up to this view every morning!!! Seriously, what more in life could you want? It's just sensational! What else is super cool is bumping into these legendary Ironmen, Guy Leech and Jimmy, in the lift on my way down to brekky. You truly never know who you'll bump into when you go to Hamilton Island. 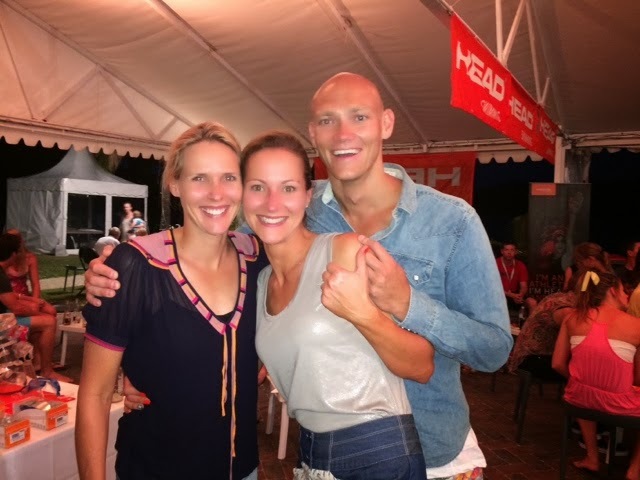 Not only was I impressed by the triathlon itself - the event was run super professionally - but the fact we got to rub shoulders with some of the country's and world's elite Olympic champions made this experience totally unreal. Check out these guys, recognise them?!!! 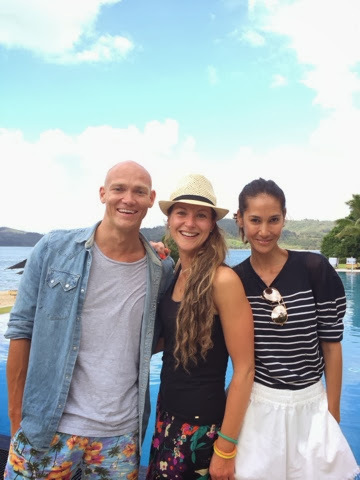 Suzie O'Neil and Michael Klim are such down to earth people, who were both very generous with their time. It was an absolute delight to hear their journeys and especially their candid "on the couch" interviews which gave a real insight into their experiences. Another day, another sensational event. We travelled on a speed boat from Hamilton Island to the most brilliant white sand beaches I have ever been to. These two swims were 750m and 2km open ocean swims and they were positively thrilling to watch. 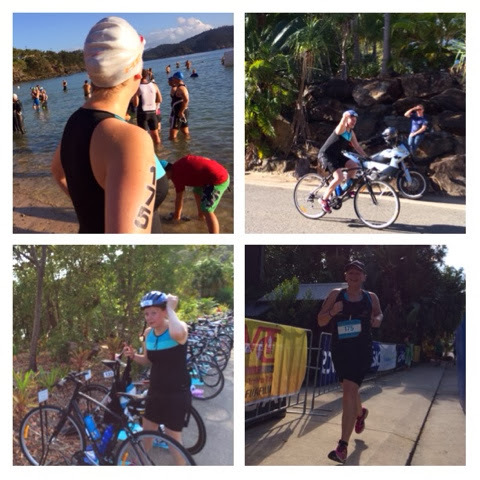 So all in all, Hamilton Island is not only a place I'd love to travel to on holidays with the family but also it would be fantastic to arrange a group of friends to head there for a fit-cation and give these triathlons a go!!!! Sensational, don't you think? Oh yeah..... how could I forget? 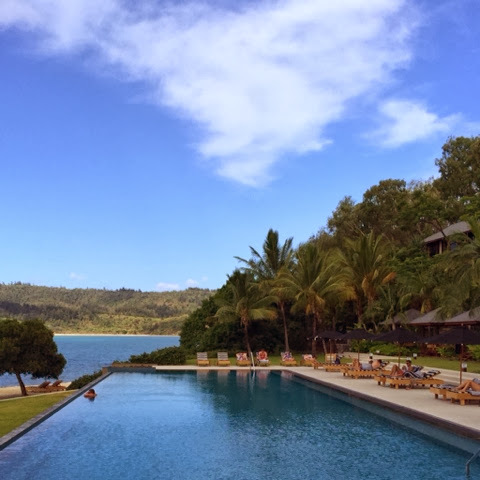 Before I go, check out the amazing Qualia Resort (woot-whoo a couples only retreat) where I caught up with the Klims for lunch. This place was totally breathtaking and I seriously can't wait to go away on a romantic holiday with Adrian. Soon! Plus, you really should know these guys totally rock. Both Michael and Lindy are gorgeous people and I can't wait to share the interview I did with Lindy very soon, as she is one stylish woman! Here's Michael & I fooling around with a bit of back and freestroke posing. Such good times.